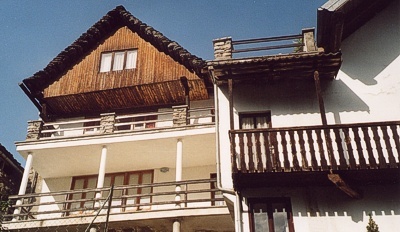 As a family we have two holiday homes situated in a tiny hamlet, just over 800m above sea level, close to the small town of Bannio in Valle Anzasca, Piemonte. One of the homes is divided into two relatively modern apartments, while the other retains much of the style of the local properties, both inside and out. One of our apartments is available for rental as holiday accomodation to families who are known to us, either personally or through friends or prior contact. The other, upper apartment is available to close friends and family only. The house is not currently being made available for holiday accomodation. These pages are provided for anyone who is planning a trip to one of the properties, and we hope the introduction will prove useful and whet your appetite. We also wish you a very happy and peaceful time there. Each of the three properties is self-contained, with its own bathroom, kitchen etc. The guest apartment features a large open fireplace. The two houses are next to each other, as you can see in the photo to the left. 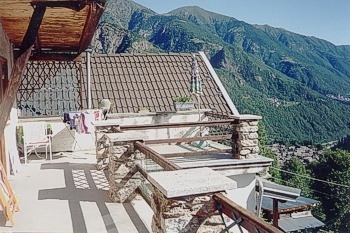 The upper apartment has an L-shape balcony that extends across part of the adjacent house, giving breathtaking views up and down the valley. Each apartment has two bedrooms and a good sized living-dining area, while the house has three bedrooms. The loft area you see in the picture, with its window, houses a small library at one end. The house and top apartment have freeview satellite television, providing a number of non-Italian channels including BBC World News. Unlike the seaside, where it can be difficult to escape the heat, the fresh mountain air means all you need to do is come indoors and you’ll instantly feel fresher. Great for people like me who love the sun but suffer a bit in the heat! There are lots of lovely walks right from where you are - no need to take the car anywhere! Paths are generally well marked. Of course some of the walks require a certain level of fitness, but you can always pace yourself, keeping to the more gentle piemonte italy holiday apartmentsslopes of the surfaced road that leads up beyond the village, or down to a lovely river at Val Piana, with ice cold water that runs straight off the glacier. Still not cold enough to stop our boys swimming in it! We have listed amongst our pages places to eat locally but you'll probably want to take advantage of the wonderful food on offer and prepare some delightful meals of your own. There are two small local shops in Bannio that sell food and drink and we encourage you to use these whenever practical as it helps the local community. For local ice cream we thoroughly recommend the newsagent on the bend as you come up from Bannio towards Fontane. During the summer season it's almost impossible to resist peering through the window into the icecream cooler and buying one of the many flavours she has to offer. For major shopping, the nearest big supermarkets are at Villadossola and on the way in to Domodossola, where you will first pass a Co-Op and then, some way further on, there is a Carrefour within a "Centro Commerciale" or shopping centre. Domodossola is the closest place to go shopping for other things, such as clothing. The street market on a Saturday morning is very popular with tourists but has diminished a little in our eyes over the years, precisely because they know it attracts lots of tourists. Bargains are there to be had but not like in years gone by. But the food stalls are wonderful and the produce is well priced, as it has to be since they rely on the locals buying all year round! We recommend the UPIM department store in Domodossola - in late summer they usually have a sale and there can be serious bargains to be had, especially clothing. And, since it is a national chain department store and not a market stall, you can be more confident of the quality of their merchandise! Apart from Domodossola, the place to go for a good half-day or full day visiting the shops is Gravellona Toce. Gravellona, which is on the main SS33 'statale' road, was the main crossing point over the river Toce in past times. Indeed, the original bridge suffered numerous collapses as a torrent of water would sometimes flow from further up the valley, and this would effectively cut off people on the 'wrong side' of the river. It's not much of a problem these days though, and Gravellona now has a very nice shopping centre, built around 2005, as well as other shops and a second shopping centre close to the first. Turn off the SS33 and follow the road in towards the town just a short distance until you come to a large roundabout - the main shopping centre is on the left and you can't really miss it. There are fast-food restaurants on the upper floor, a large supermarket, numerous fashion stores, a video games store and so on - something to keep just about everyone happy. And plenty of parking, either directly outside the front of the store or, if you continue to the next roundabout and go right, then take the ramp down into the underground car park. Alternatively, if you take the first exit right off the roundabout (instead of going left), then the next right again, the road brings you to a second, smaller shopping centre - there's a large sports/fashion shop, a shoe shop, an electrical/music/DVD retailer and household/DIY store here.